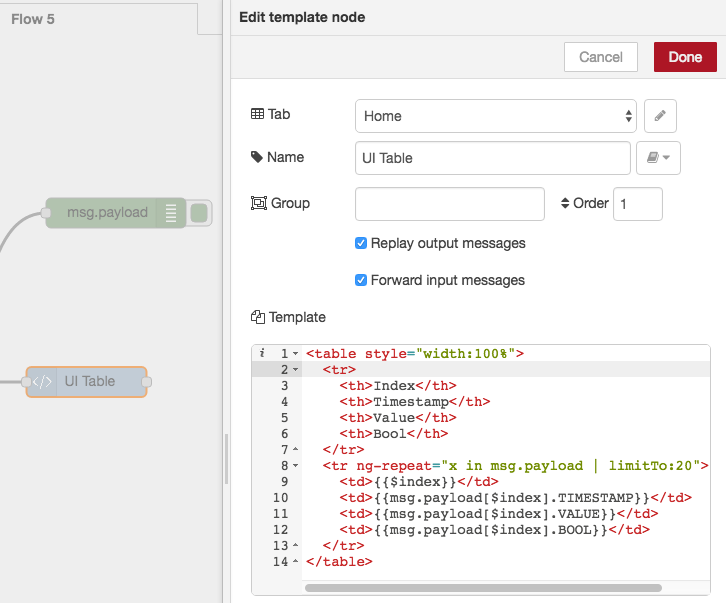 This tutorial will show you how to make use of an SQLite database using the litedb node on the FRED hosted Node-RED platform to create database tables and store data. 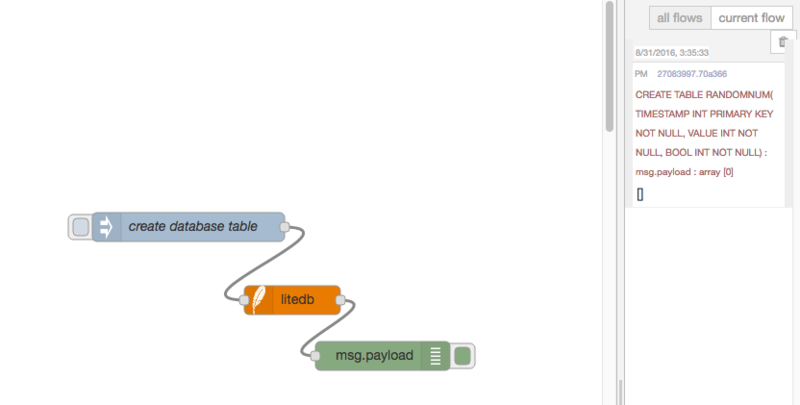 Under the hood, the litedb node uses SQLite. As a very lightweight relational database, SQLite does not need complex setup procedures, making it an ideal database management system to use for embedded systems and rapid prototyping. There is no way to specify the database file. Your FRED instance only uses a single SQLite database. Keep in mind that, although there is a limit of 4mb, you are still able to create as many tables as you want up to the size limit. With the sample table that we created for this tutorial, the 4mb database file is able to hold approximately 140,000 records. For more information on SQLite see More documentation can be found on https://sqlite.org/. 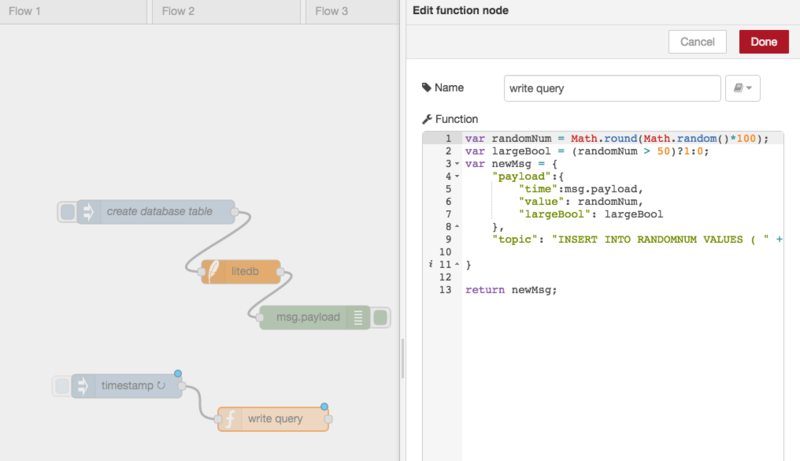 The Front End for Node-RED (FRED) manages instances of Node-RED for multiple users in the cloud. We manage and optimize your instance of Node RED so you worry about accomplishing your project, not setting up and maintaining your Node-RED instance. 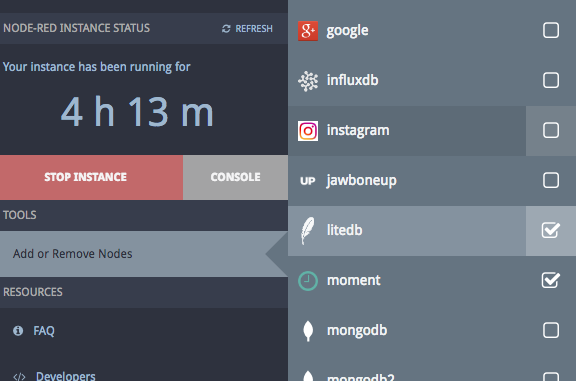 To get started, create your own Node-RED instance in the cloud. Register for a free account at http://fred.sensetecnic.com. After registering, make sure to activate your account via your email. You will not be able to login until you validate your account. First, you will need to ensure that you have installed the litedb node since it is not installed by default in FRED. After you register for FRED, or after you login, you will be presented with the FRED dashboard. In the management panel, click “Add or Remove Nodes“, and find the litedb node. Make sure the litedb node is installed for your instance. If the box beside ‘litedb’ is empty in your Nodes list, just simply check the box and restart your instance. Make sure you start your instance by hitting the start button. If it is already started, stop, and start it to ensure the new litedb node is available. Create a new tab to start with an empty canvas. Once the litedb node is installed, you should see the litedb node in your left panel. Drag a litedb node to the empty canvas, and we are ready to move on. You can also name the litedb node however you like by double clicking on the node to open the configuration dialog if you like. 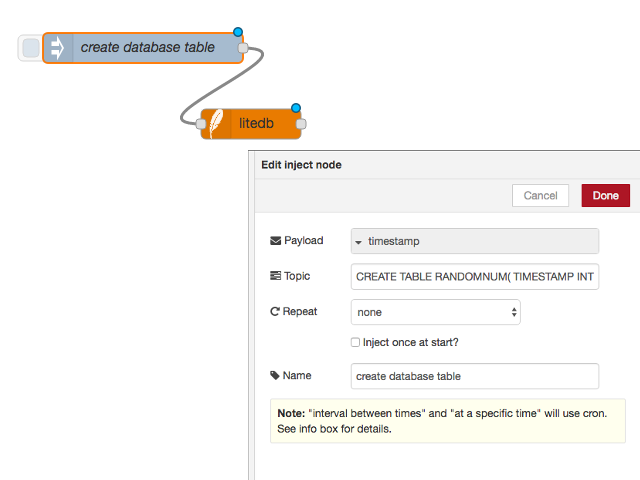 For demo purposes, we are going to create a table and inject random numbers at a constant time interval. We will also look at how to view and manage this data later on. As you can see, this demo table is called “RANDOMNUM“, and it has three columns, TIMESTAMP( Primary key column ), VALUE, and BOOL. (We will use BOOL to store an attribute which indicates if the number is larger than 50 or not) These three columns are all set to NOT NULL and with type INT. 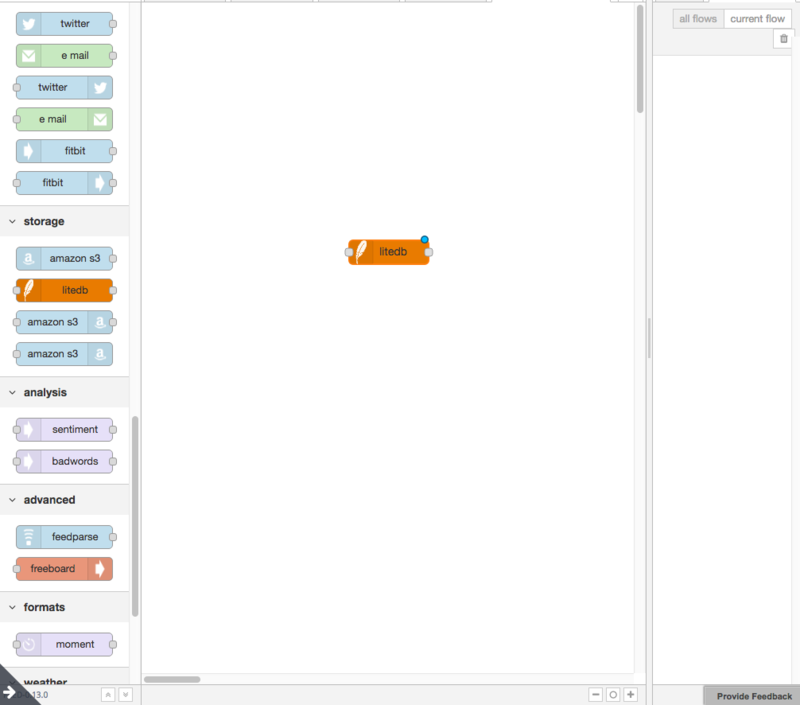 Once you are done, connect a debug node to the litedb node, and deploy the current settings. Hit the inject button, and you should see that RANDOMNUM is created. We can use the same method to send an SQLite query to the database to inject a new value into the table. 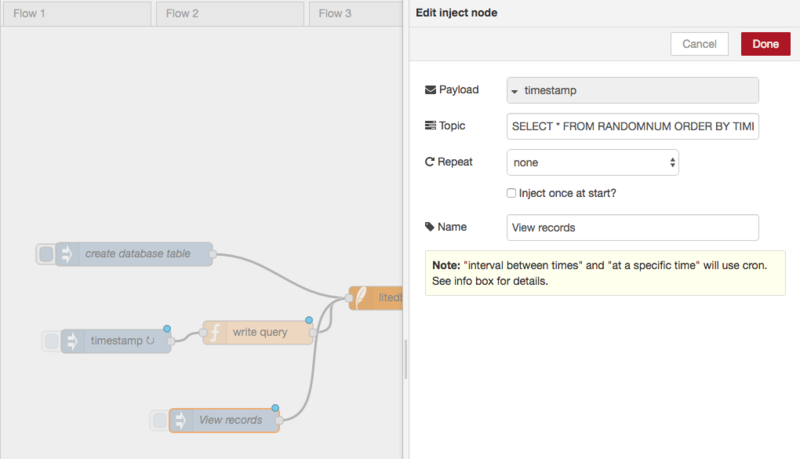 Let’s set up another inject node that injects a new timestamp every 15 seconds simulating a sensor event. Followed by a function node, we will write a query with the input of the timestamp, and send the insertion query to the litedb node. First, drag a new inject node, and add these settings. then, let’s connect this timestamp node to a function node. "topic": "INSERT INTO RANDOMNUM VALUES ( " + msg.payload + ", " + randomNum + ", " + largeBool + ")"
In the above code, a new record is inserted into RANDOMNUM with a timestamp as its primary key, a randomly generated value (ranged from 0 to 100), and a boolean value as if the number is larger than 50. Notice that there is no actual boolean data type in SQLite, so we represented boolean as either 0 or 1. 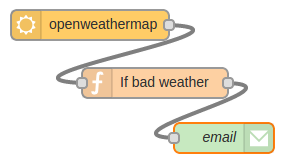 Then, we can just connect the function node to the litedb node as follow. Once you hit deploy, the inject node will start inserting new records to the table. 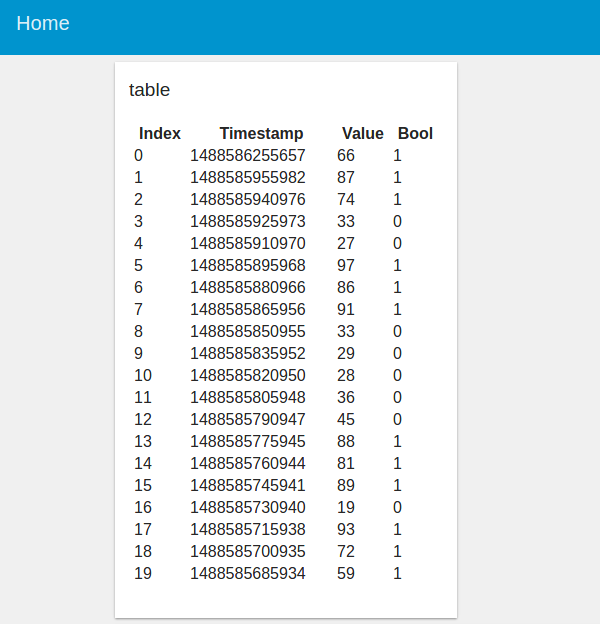 As you can see, we are showing the first 100 records in table RANDOMNUM ordered by the TIMESTAMP column in descending order. If you follow this guide, you will notice how we set up an inject node that injects records in 15s intervals. In real world scenarios, the database grows in size and may eventually affect the performance of servers. In addition, and as mentioned above, the litedb node has a limit of 4Mb in size. Here we will show you an example of how to delete older records that you do not want to keep. We will set up another new inject node, and call it ‘delete’. For this example, it will run the delete query every minute, to remove the data that is older than 1 hour. Notice that, the timestamp generated from the inject node is UNIX epoch time in milliseconds, but the default timestamp return from the SQLite function strftime() is in seconds. That’s why we need to multiply 1000 at the end. 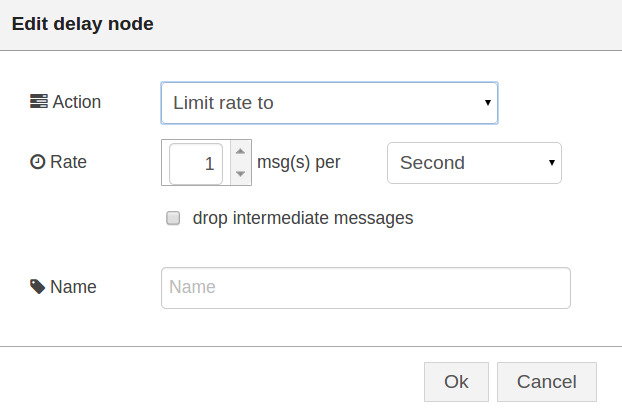 Don’t forget to connect the inject nodes to the litedb node in order to send the query command into SQLite! Now sit back and see how the node clears out the old data for you in the debug tab. Users are able to visualize the data by using the dashboard nodes. You can refer to the tutorial in A Node-RED dashboard using node-red-contrib-dashboard for more information on how to do this. In this tutorial, we will show you another trick to visualize the data in a table form. into the litedb node, it returns an array of records in the response, we can simply use the ui template node to parse the information we want.